Many studies have shown that apes and monkeys are adept at cross-modal matching tasks requiring the subject to identify objects in one modality when information regarding those objects has been presented in a different modality. However, much less is known about non-human primates’ production of multimodal signaling in communicative contexts. 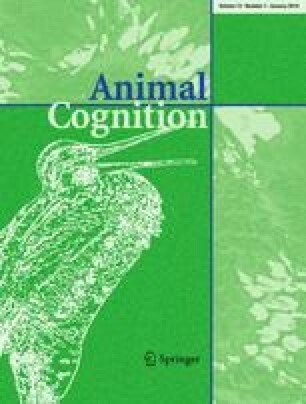 Here, we present evidence from a study of 110 chimpanzees demonstrating that they select the modality of communication in accordance with variations in the attentional focus of a human interactant, which is consistent with previous research. In each trial, we presented desirable food to one of two chimpanzees, turning mid-way through the trial from facing one chimpanzee to facing the other chimpanzee, and documented their communicative displays, as the experimenter turned towards or away from the subjects. These chimpanzees varied their signals within a context-appropriate modality, displaying a range of different visual signals when a human experimenter was facing them and a range of different auditory or tactile (attention-getting) signals when the human was facing away from them; this finding extends previous research on multimodal signaling in this species. Thus, in the impoverished circumstances characteristic of captivity, complex signaling tactics are nevertheless exhibited by chimpanzees, suggesting continuity in intersubjective psychological processes in humans and apes. This work was supported in part by NIH grants RR-00165, NS-42867, NS-36605 and HD-38051. The Yerkes Center is fully accredited by the American Association for Accreditation of Laboratory Animal Care and American Psychological Association guidelines for the ethical treatment of animals were adhered to during all aspects of this study.